Millions of workers in the global economy have been disenfranchised from their rights, either tacitly or deliberately by governments, exacerbating “global inequality, poverty, violence and child and forced labor,” says Maina Kiai, United Nations Special Rapporteur on the rights to freedom of assembly and of association, in a frank report presented last week to the United Nations General Assembly in New York. 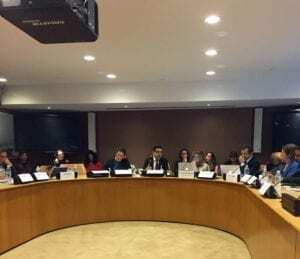 The Special Rapporteur also launched the report on workplace rights at a side event at UN headquarters, where he warned of “an assault on labor” that has been going on for years. 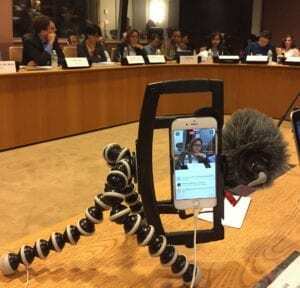 The side event was co-sponsored by the Solidarity Center, AFL-CIO, Ford Foundation, Human Rights Watch and the International Trade Union Confederation. Shawna Bader-Blau, executive director of the Solidarity Center, facilitated the discussion. Speakers at the side event confirmed that the erosion of rights in the workplace is a reality around the world. Over the course of four hours, panelists discussed freedom of assembly and association (FOAA) as it relates to fundamental human rights, working women, migrant workers and supply chains, business and human rights. Watch the video here. 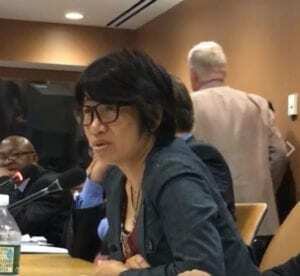 Kyoung-Ja Kim, vice president of the Korean Confederation of Trade Unions, (minute 5:15) told the packed meeting room that workers in Korea who exercise their rights “are often treated as criminals.” She described a July 2016 march in support of worker rights, which ended with a violent police response that left a 69-year-old protester dead. Police were given immunity, yet the organizer of the protest was jailed, said Kim. In addition, when crane workers tried to negotiate with their employer and were refused, they went on strike. Their union was charged with a crime and leaders were convicted. 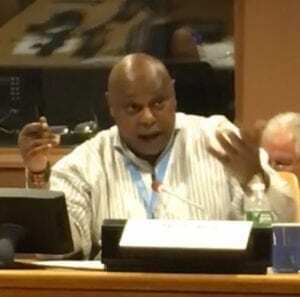 Swaziland, Africa’s last absolute monarchy, has lost access to the Africa Growth and Opportunity Act due to non-compliance with internationally recognized worker rights, said Vincent Ncongwane, secretary general of the Trade Union Confederation of Swaziland (min. 15:12). In addition, people are losing access to land. They are being evicted for their exercise of freedom of speech. And the right to protest is limited, he said. Monserrat Mir Roca, confidential secretary of the European Trade Union Confederation, (min. 24:16) said that the right to strike is recognized in the constitutions of many European countries, and trade unions are recognized as legal actors to negotiate for better conditions for workers. 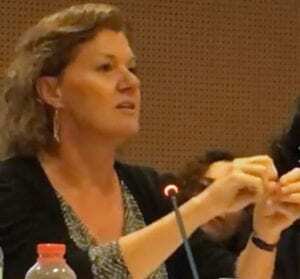 It is important that Paragraph 56 of the Special Rapporteur’s report “unambiguously defends the right to strike,” including as a matter of customary international law, said Jeff Vogt, (min: 32:30), director of the legal unit at the International Trade Union Confederation (ITUC). He said attacks on freedom of association rights are increasing in frequency and come from surprising quarters, including the Employers Group at the International Labor Organization (ILO). The participation of women in the labor market has increased—but has not been the often touted panacea for economic growth or women’s economic empowerment, according to Chidi King, director of the ITUC equality department, who moderated the panel examining issues related to working women and freedom of association (min. 49:30). On the contrary: The majority of jobs for women around the world are informal, precarious, pay poverty wages and are exploitative, with violence on the job a serious issue, she said. 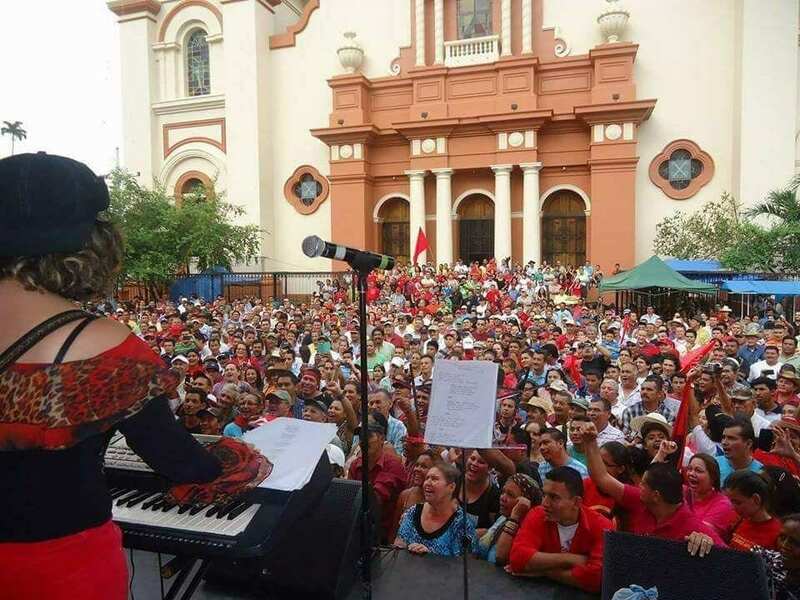 Evangelina Argueta, who coordinates maquila organizing for the General Workers Confederation (CGT) of Honduras, (min. 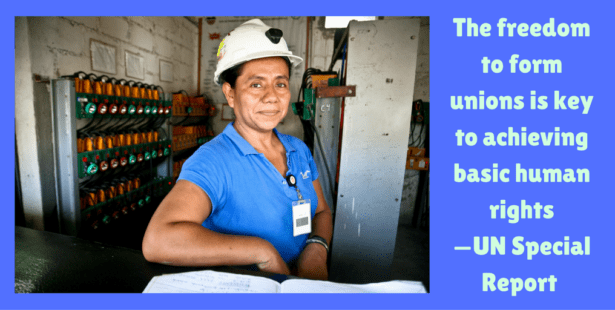 57:24), said that while women garment workers—through their unions—have made some gains in terms of wages and safer workplaces in Honduras, women in export agriculture are caught in more challenging and dangerous circumstances. Pregnant women have been dismissed, worker rights advocates are blacklisted and protests are criminalized. Some companies overtly thwart the formation of unions by firing labor leaders. And around the country, women organizers are receiving death threats while the state does little to protect activists. 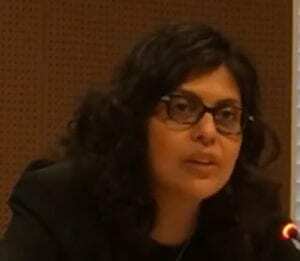 Purna Sen, director of policy at UN Women, (min: 1:06:52), said human rights features in all the work of the organization. 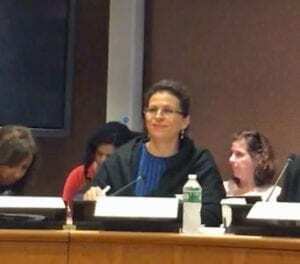 The issues raised in the report, she said, are particularly timely as women’s economic empowerment is the theme of the 2017 Commission on the Status of Women meeting in New York. “The interconnections of human rights, labor rights and women’s economic engagement are absolutely critical,” said Sen. Opening the panel on migration and freedom of association, Gloria Moreno-Fontes Chammartin, ILO senior labor migration specialist, (min. 1:31:22), reminded the audience that freedom of assembly and association (FOAA) are core values of the ILO, and that FOAA is included in its constitution and Declaration of 1944. She outlined the various conventions and UN declarations (e.g., the 1998 ILO Declaration on Fundamental Principles and Rights at Work, which commits ILO member states to respect and promote the four categories of principles and rights at work whether or not they have ratified the relevant eight conventions on freedom of association and the right to collective bargaining, the elimination of forced or compulsory labor, abolition of child labor and the elimination of discrimination in respect to employment and occupation) that reaffirm migrant workers’ rights, regardless of migration status or nationality. For example, the right to collective bargaining applies to all workers regardless of status in ILO member countries. Despite international labor standards and agreements, the situation for migrant workers is often dire on the ground. For example, “migrant workers make up nearly 90 percent of workers in some Gulf states, but enjoy few to no labor rights,” said Sarah Leah Whitson, Middle East director for Human Rights Watch (min. 1:39:49)). She said that 15 million to 20 million people are migrant workers in the Gulf and cover every job, skill and education spectrum, with the largest concentration of migrant workers in construction and domestic work. Most of these workers face “a triangle of oppression:” a kefala (sponsorship) system that puts the power in the hand of a private employer; the near-universal practice of employers confiscating workers’ passports of workers as “insurance”; and recruiting fees that are often a financial hardship for workers and keeps workers in bad jobs. Workers can spend two to three years working just to repay loans taken out to cover recruiting fees. At the same time, many of the 9 million guest workers in the United States, who enter the country on special visas, are in “industries excluded from labor law, de jure or de facto,” and industries that “are of a direct lineage to slavery and are enmeshed in the same political economy of race,” said Saket Soni, director of the National Guestworker Alliance, (min. 1:49:15). Like the kefala system, a guest worker’s visa in the United States is tied to the employer, which leaves them vulnerable to abuse. Workers in seafood processing, for example, have reported grueling work conditions, forced overtime, harassment and exploitation. In one case, Soni said, forced compulsory overtime coupled with the threat of retaliation was so severe that workers “developed the motor capacity to work while sleepwalking for entire shifts at night.” If they complained, the employer reported them to Immigration Services. In at least one case, the level of exploitation was deemed forced labor by U.S. courts. Meanwhile, the creation of the “Asia global factory” has led to the largest rural-to-urban migration in the history of mankind, said Sanjiv Pandita, Asia regional representative for Solidar Suisse Hong Kong, Special Administrative Region of China (min. 1:59:14). The global supply chain relies on an “institutionalized mechanism that harvests cheap labor,” pulling people from rural areas to factory zones. He said workers move to escape poverty, but wind up on the lowest tier of the supply chain. They work long hours in dangerous workplaces for subsistence wages because they lack FOAA rights, while multinational corporations profit. “Asia has the largest population of working poor people. This is why we have a huge crisis of democracy because workers do not have rights to form unions and demand their fair share of the wealth being created,” he added. For the fourth and final panel—Supply Chains, Business and Human Rights—Cathy Feingold, director of the AFL-CIO’s international department, opened the session (min. 2:11:35) by issuing a call for a new global standard to address the more complex problems workers face, the agreements and standards that have been set aside, and the rules that were not designed for worldwide supply chains. Amol Mehra (image in video, above), director, International Corporate Accountability Roundtable (ICAR), agreed (min. 2:22:06). “We need to challenge the idea that supply chains are too complex to handle. There are inflows and outflows, and governments can set controls to protect rights,” he said. “Communities must come together to demand the rights they deserve. To build that power, we need to tackle global power,” he said. Mehra added that governments have a duty to protect human rights—and should start conditioning benefits to companies on how those companies respect these rights, including freedom of association. When it comes to supply chains and violations of human and worker rights, “the laissez-faire system of enforcement is not working. Companies intentionally go to countries with weak labor laws and weak enforcement,” said Jo Becker, (min. 2:30:52), advocacy director for Human Rights Watch’s children’s rights division, which focuses on supply chains in three sectors: clothing produced for major brand names, gold mining and tobacco. Children produce 15 percent of the world’s gold, for example.